If you’ve been hanging out on the regular, you were probably geared up for Part 3 of the Aspergillus series. I had a short work week last week, and on my last day I realized on my bus ride home that I totally wasn’t prepared. Whoops….HOWEVER, I was inspired to do something a little different this week by one of my followers on instagram who had a really good question. 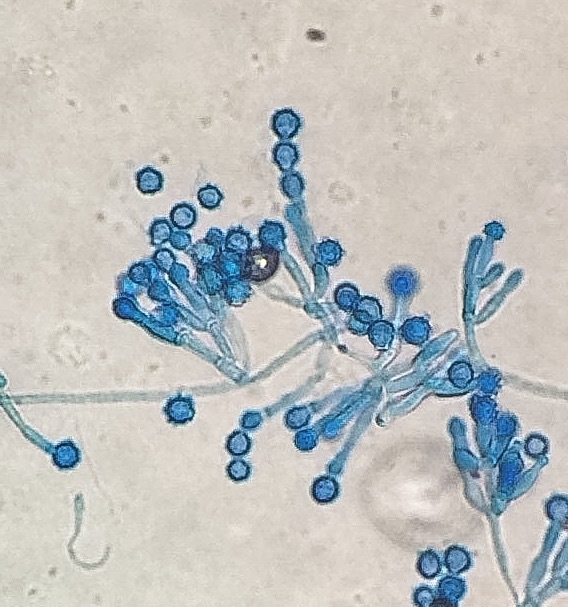 I’d posted a picture of a Penicillium species, and she had at first glance almost mistaken it for a Scopulariopsis. She mentioned that without the macroscopic morphology (the actual growth in the petri dish), it’s difficult to tell the two species apart. She wondered, “Is there anything to look for to distinguish [Scopulariopsis] from Penicillium sp. ?” That’s a really good question. 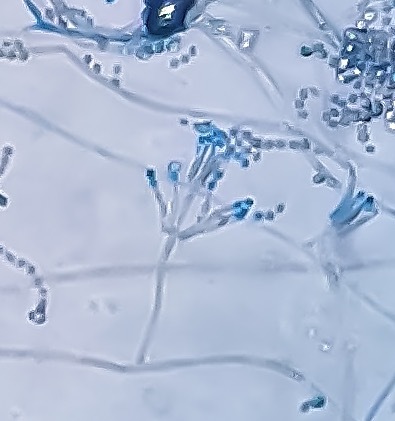 Guess what else looks like Penicillium? Paecilomyces. Hold on now, there’s one more…guess what else looks like Penicillium?? C’mon…guess!!! Okay, okay. It’s Gliocladium. WTF, right? That’s four species of fungus that microscopically look very similar. Even an experienced microbiologist might have some difficulty in differentiating these species from one another. They all have these sort of “flask” shaped or “vase” shaped phialides, round(ish) conidia, and are all hyaline hyphomycetes, My mycology Bible lists Penicillium first, and then compares the other three to her. So, let’s start with Penicillium and then go from there! The overall structure of Penicillium is said to be “brushlike” in appearance, or like “skeleton hands.” When describing this fungi in my work I prefer to go with “skeleton hands”, because I like that one better. From septated hyphae, conidiophores form. They may be either branched or unbranched, and have a secondary branch…a metulae. The flask-shaped phialides form on the metula in clusters. I typically see phialides in clusters of 3, but can include as many as 5 . From the phialides, long chains of round conidia. On agar, this organism is usually a beautiful bluish green color. Low and velvety in texture, and develops a white border. The reverse side of the agar tends to be white, but I sometimes see reddish or brown pigments. 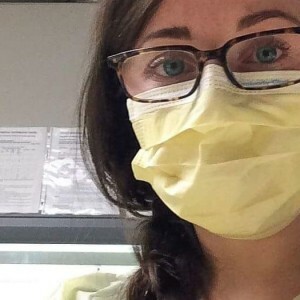 There are other pigments that Penicillium can produce, but they are less frequently encountered in the clinical setting. On to the next one. The next one on the list is Paecilomyces sp.! Look at that picture. I swear, you guys. It’s NOT a Penicillium. But it sure kinda looks like it, right? Microscopically, the difference is in the phialides. Paecilomyces has longer, more delicate phialides than Penicillium. They taper down to a narrow tube, giving them a bowling pin or “tenpin” appearance. They tend to angle away from the conidiophore with a greater bend at the axis than Penicillium. 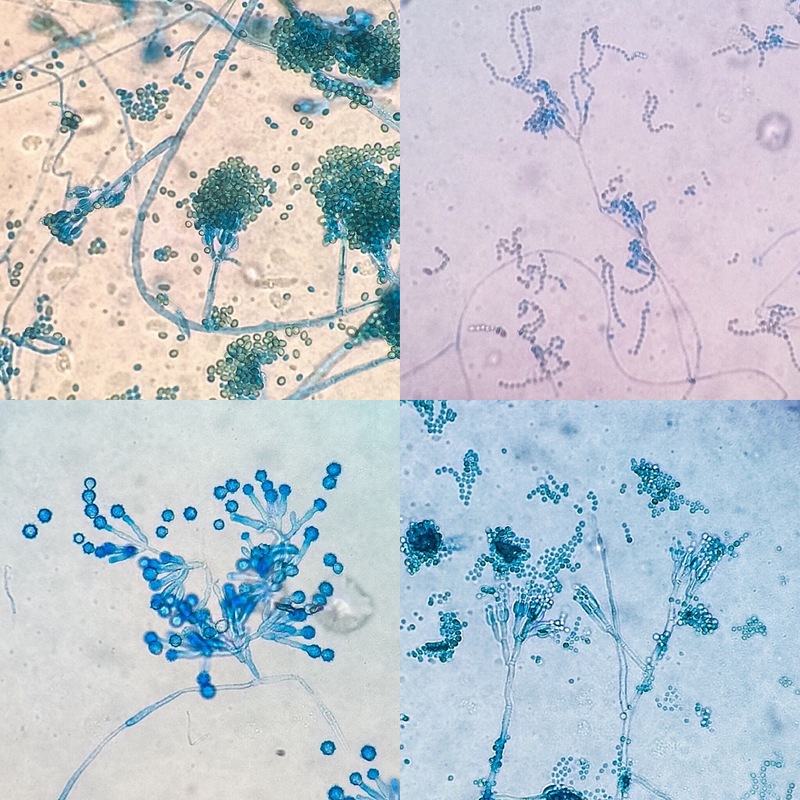 Their conidia generally appear to be more elliptical than the rounder Penicillium conidia, though in both species the conidia form long chains. Macroscopically, I most frequently see Paecilomyces in a really nice lavender/mauve color (P. lilacinus) with a white border. The other one I see is a crazy mustard yellow or like, puce green (P. variotii). Is that a word? Puce? Or maybe “chartreuse”? Whatever. LUCKILY, here’s the saving grace…it is NEVER bright green or blue green. If your colony is that color, but looks like this, it’s probably a Penicillium. Moving forward. I love these guys. So robust! Scopulariopsis has tenpin shaped ‘annellides’ instead of ‘phialides’ like the other species discussed in this post. Annellides and phialides are shaped the same way, and do the same thing; extrude conidia. However, an annellide actually grows with each conidium it produces. Like baby weight. They gain a little extra cell wall material each time one pops out. The annellides are arranged in ‘brushlike’ clusters, very similar to Penicillium. The conidia are also round and form chains. 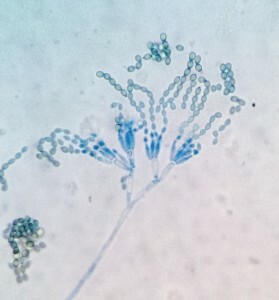 However, the conidia of Scopulariopsis tend to be spiky or rough around the edges and larger than Penicillium’s. Also, if you squint, you can see that the base of the conidium is flat on one end. The conidiophores of Scopulariopsis are generally shorter and simpler than those seen in Penicillium. Macroscopically, the surface of the colony is pale tan or kind of sandy in color. There are a few rare species that can be dark gray or black, but I’ve never seen one of those. The reverse is generally tan, with a dark center. Ok, one more. ONE MORE! Hang in there! The last one our list tonight is Gliocladium! I did a more detailed post about this one a few weeks ago which you can read here. This structurally is very similar to Penicillium. The hyphae, conidiophores, phialides, and conidia ALL resemble those of Penicillium. 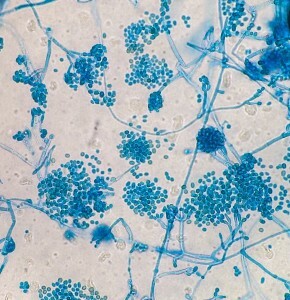 The biggest difference is that the conidia clump together to form clusters instead of forming long chains. Macroscopically, the color is similar to Penicillium. Mostly shades of green. I’ve heard they can be pink…I have yet to witness that. Gliocladium gets very fluffy though, whereas Penicillium tends to stay low and velvety. The reverse side of the agar is typically white or light in color. Whew! Ok. That was all four. While I was writing this I thought to myself, “Huh…maybe I should’ve done the Aspergillus series all in one post like this.” Nooooope. Definitely, no. 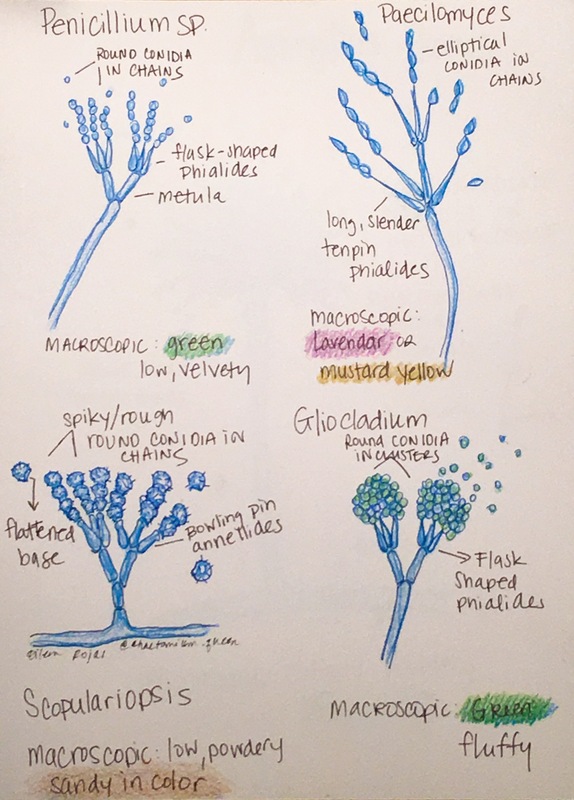 I have a simple sketch below to kind of summarize quickly the major structural differences in these organisms. If you have any questions, please don’t hesitate to email me!